Sony is hoping to combat its poor PS Vita sales with a sleuth of PS Vita bundle discounts. 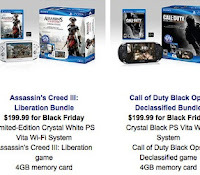 The Assassin’s Creed III: Liberation, Call of Duty: Black Ops - Declassified, and LEGO Batman 2: DC Super Heroes PS Vita bundles will all be available for $199.99 on Friday, Nov. 23 and Saturday, Nov. 24 at retailers. The Assassin's Creed and Call of Duty bundles include an additional 4 GB memory card in the bundle while the LEGO Batman 2 bundle does not. Will this improve sales? Let us know what you think in the comments below!